I was browsing the web on my iPhone while walking alone through Sydney's laneways last Friday. I would call myself a flaneur, but I was too busy stalking the one I love on Facebook. If I could translate profile page loads into roses, dates and confidence she would love me too. I was about to trip over a gutter so I looked up from my phone, because I was forced to, and onto the footpath/sidewalk/concrete. I saw two stencils, the one above by Fukt. It depicts a bum resting at home -beside a supermarket trolley in the street. The phrase 'Best We Forget' is a play on the ANZAC phrase 'Lest We Forget', i.e. it's how we remember the Australian and NZ men and women who fought in the wars. 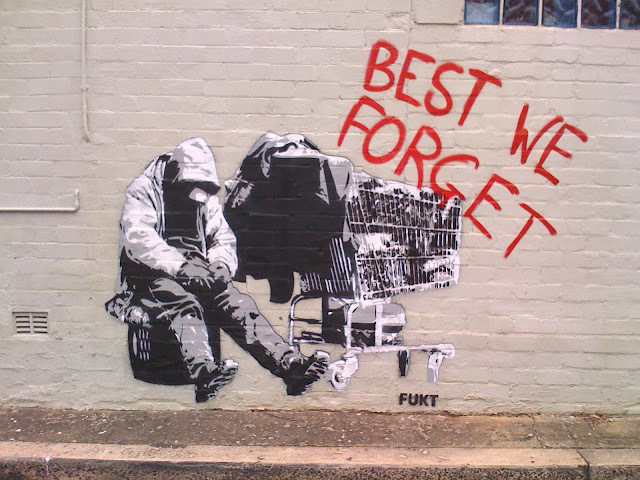 Fukt is Australia's equivalent of Banksy in terms of style. I would go so far as to say he is Banksy's equivalent of Banksy. And I saw this too. I'm still unsure who did this or what it means. I see a boy, a boy looking up at me (you're such a bad father) with a firecracker/Red Bull/light saber. I'm not immediately alarmed, possibly because homeless people are a more visible pollution, but I know this kid is in trouble. Wait - is this kid me? The green boy is an oldie but a beauty by Mox. I know because Will told me. 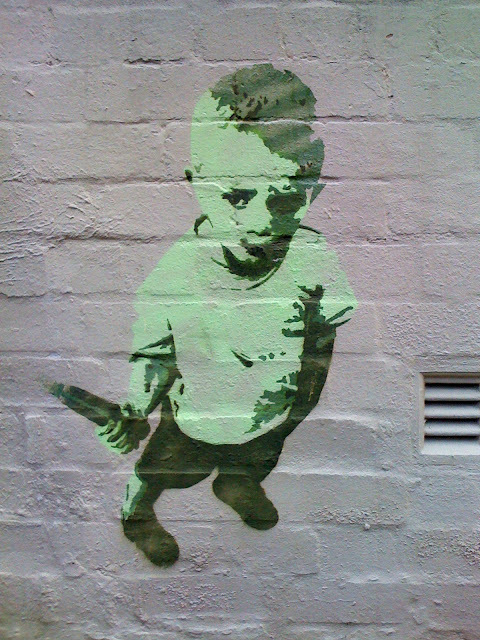 BTW, the stencil is by Mox but the kid is actually Superfly. Its a box cutter in the boys hand, I know because I use one every day. Thanks guys. I honestly couldn't do this without you.